At Pain Physicians NY (Brooklyn, Queens, Bronx, Manhattan NYC) hip joint pain doctors and pain management specialists effectively treat all grades of hip pain. Brooklyn hip pain management specialists are selected to be a part of the international medical team for the Rio Olympic Games. There are different medical conditions that may cause pain around the hip. First of all, though, we need to identify the most commonly affected areas of the hip and narrow down the problems that may affect them. The pelvic bone is often referred to as the hip bone because it is the main bone around the hip. Two femur bones (thigh bones) are then connected to the pelvic bone on opposite sides and provide support for the torso from the legs. The pelvic bone also terminates the spinal cord at the sacrum. 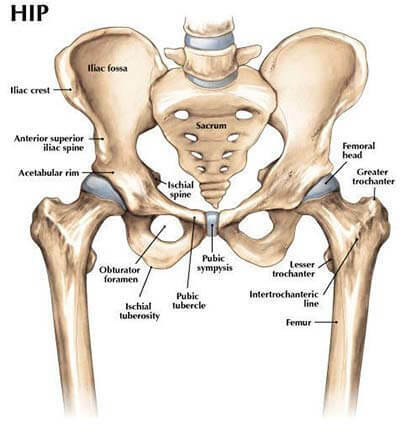 A direct impact on any of the bones in the pelvic region causes damage to the joints and subsequently leads to pain. Injuries to the side of the hip are especially common after a fall or injury at work, and these cause increased pressure on the joint between the femur and pelvic bone. When this happens, the individual will experience pain around the hip which may extend downwards into the legs. Hip joint pain as a result of trauma and injury does not affect the entire hip, however, but often affects only one side of the hip. Besides, injuries to the hip joints are most common among those above 65. Sure, injuries can happen to anyone, but those who are younger can always recover quickly unlike the elderly who take a while longer. Also because of age, the elderly are also prone to having a broken hip whereas the younger generation may only have a fracture. Treatment of hip joint pain due to trauma often involves physical therapy to help the bone recover and to strengthen the muscles to handle the pressure better. This is a condition whereby the bursa becomes inflamed, causing a hindrance to motion in the joint. Inside every joint is a fluid-filled sac which provides lubrication for the joint and also to absorb some shock. When this sac becomes infected, it becomes inflamed and swollen, causing the joint to lose its flexibility and sending pain around the hip. Pain due to hip bursitis is often exacerbated by walking because the joint is in motion. Eventually, the inflammation goes down on its own with adequate rest, but sometimes antibiotics and pain relievers may be prescribed to help reduce the inflammation. An autoimmune disease without a cure, that causes inflammation in the joint. However, there are several management options for RA that relieve hip joint pain. This happens when the cartilage protecting the bone wears off and causes the bones to lose lubrication. This is often the result of ageing but can be managed through physical exercise. Caused by excess uric acid in the body, it causes the bones in the joints to lose cartilage and begin to lose flexibility. The most advanced pain management center, Brooklyn pain management doctors and specialists at Pain Physicians NY offer unique, individualized approach to manage your hip pain. We are using the most effective pain management and treatment options including electrical nerve stimulation, Platelet Rich Plasma (PRP) and Corticosteroid Injections and utilizing the latest technologies available in USA.